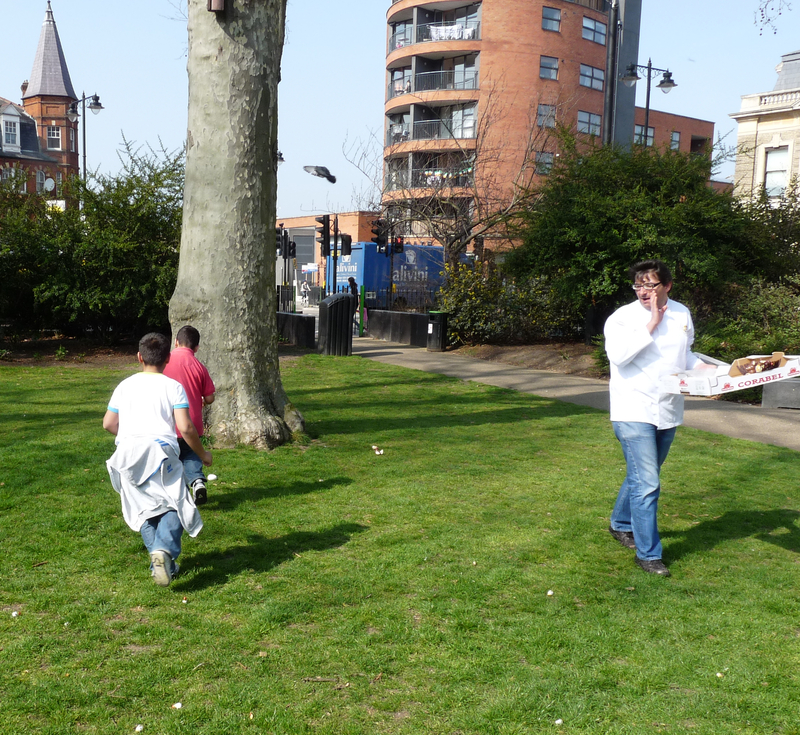 THE EASTER BUNNY has a special treat for the children of Newington Green. Chocolates made by a French pâtissier will be scattered on the common for lucky toddlers, intrepid weenyboppers and acquisitive teenagers to gather up and gulp down. A Loving Dalston investigation can reveal Belle Epoque, the Parisian-style pâtisserie, chocolatier and bakery that overlooks the green, as the centre of the operation. Eric Rousseau, in charge of all the goodies that whisper temptation from the café’s display shelves, has been photographed doing a dry run, shouting “Chocolates, chocolates!” to children frolicking on the green in the spring sunshine. Rousseau admitted that he will give advance notice to teachers at nearby Grasmere Primary Schoolin Albion Road N16 9PD when he hides his high-quality eggs in special spots around the green for Easter. He told Loving Dalston that he founded Belle Epoque ten years ago. It had grown so well that he and his wife Hulya now employ 20 full-time staff, including apprentices. The business is still expanding: Belle Epoque supplies Selfridges in Oxford Street and will soon be delivering to the prestige store’s Birmingham and Manchester branches. You can buy a tarte for £1.25 and the price range goes up to a grand production for £25. Just don’t mention “cupcake”. To a pâtissier who started training in Paris at the age of 14, that’s for amateurs. We’ve been gracing Stoke Newington Green quite regularly in the past few days, due to this sweltering weather. Not sure it would be appropriate if us bunch of adults turned out for the egg hunt – even though I’d love to get my hands on some Belle Epoque eggs. Loving Dalston’s photographer found it difficult not to snaffle some during the trial run, especially when one chap, having warned his child against involvement with the Easter festival, then went and scooped up a handful. You’ll notice the actual day on which the bunny is to lay its eggs is not specified. Children will be in the area of London N16 9PR at the right time, or they won’t. – Ed.